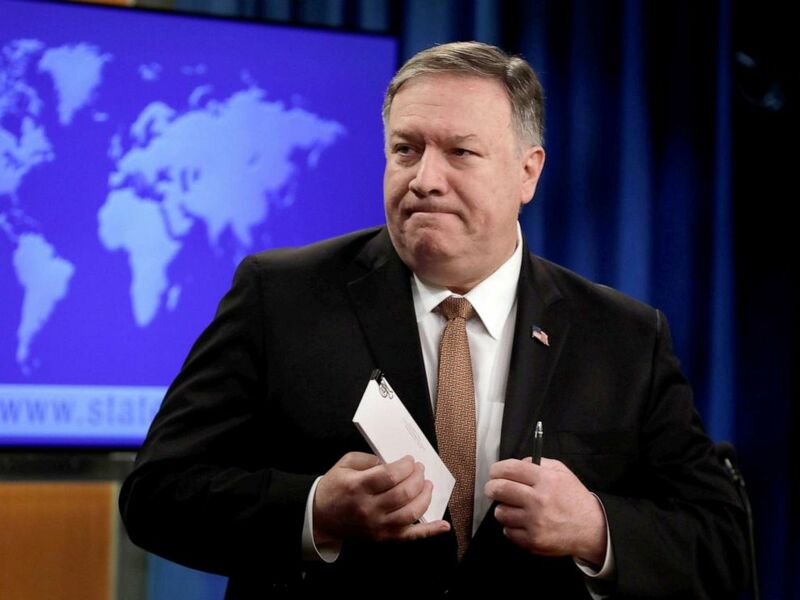 "This action will significantly expand the scope and scale of our maximum pressure on the Iranian regime. It makes crystal clear the risks of conducting business with, or providing support to, the IRGC. If you are doing business with the IRGC, you will be bankrolling terrorism," Trump said in a statement. The designation, which will take effect next Monday, is significant and controversial as it's the first time that the U.S. has officially identified a branch of a foreign state as a terrorist organization. That's led to increased concern that U.S. forces in the Middle East could face reciprocal action or heightened threats to their safety. President Trump has consistently taken an aggressive posture toward Iran and Monday's announcement is just the latest iteration of that approach. Secretary of State Mike Pompeo leaves after a briefing on Iran at the State Department in Washington, D.C., April 8, 2019. "The Trump administration is simply recognizing a basic reality," said Secretary of State Mike Pompeo. "The IRGC masquerades as a legitimate military organization, but none of us should be fooled. It regularly violates the laws of armed conflict and plans, organizes, and executes terror campaigns all around the world." The military branch is already designated as a terrorist entity under the U.S. Treasury Department -- a move that President Trump made in October 2018. Designating the IRGC on the State Department's foreign terrorist organization does not impose additional economic penalties, but it makes it a federal crime to do business with the IRGC or its leadership. Perhaps more important is the rhetorical weight of the designation too, making the IRGC stigmatized and "radioactive," according to Special Representative for Iran Policy Brian Hook. Given the IRGC's involvement in many sectors of the Iranian economy, the designation is also likely to chill potential outside investment that could now be exposed to prosecution. Ahead of the announcement, Iranian Foreign Minister Javad Zarif warned against the move, tweeting that Trump "should know better than to be conned into another U.S. disaster." The head of Iran's parliament also said Sunday the body's National Security Committee will fast track legislation to designate the U.S. military a terrorist organization in response to the move, and in a letter to President Hassan Rouhani on Monday, Zarif asked him to put U.S. Central Command on Iran's list of terrorist groups, according to the official Islamic Republic News Agency. Pompeo was dismissive of Zarif's comments, but added this warning: "We have made clear, both publicly and privately, that an attack on the United States of America is something that [Iran] ought to think more than twice about." The Pentagon declined to comment on any warning to U.S. troops in the region, but spokesperson Cmdr. Rebecca Rebarich said in a statement that, "as always," the department "has taken prudent measures to ensure the safety of our forces around the world and maintain our readiness to carry out our missions ... We have no credible information to suggest there is an imminent threat." The move comes on the eve of Israel's parliamentary election and was seen by some as an attempt to help Israeli Prime Minister Benjamin Netanyahu in his bid to retain office. Netanyahu tweeted his thanks to Trump for the move, calling it "the answer to another important request that serves the interests of our country and the region," while Zarif called it "A(nother) misguided election-eve gift to Netanyahu. A(nother) dangerous U.S. misadventure in the region" in a tweet. When asked about the timing of Monday's announcement, State Department officials said this was "the next step in the pressure campaign" against Iran.